Villagraziosa is a splendid two-storey villa overlooking the sea. It sleeps 10 people. 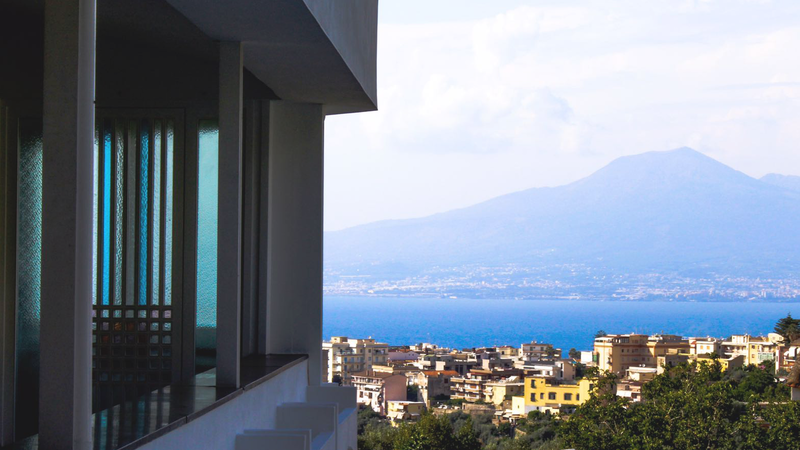 From Villagraziosa you will enjoy an enchanting view of the Gulf of Naples with Mount Vesuvius as the master. Villagraziosa is 350 square meters (3768 square feet). It has a private swimming pool, a beautiful garden in marble travertino, a private parking area, terraces with sea views, air conditioning throughout the villa, winter heating and WI-FI Internet access. You will be about 1000 meters (0.6 miles) from Marina di Seiano, where you will find restaurants, cocktail bars and the beach. You will find the bus stop 10 meters from the villa and the train station at 100 meters from the Villa. Villagraziosa has a private parking area. The villa is built on a high plot of land near the coast surrounded by nature. 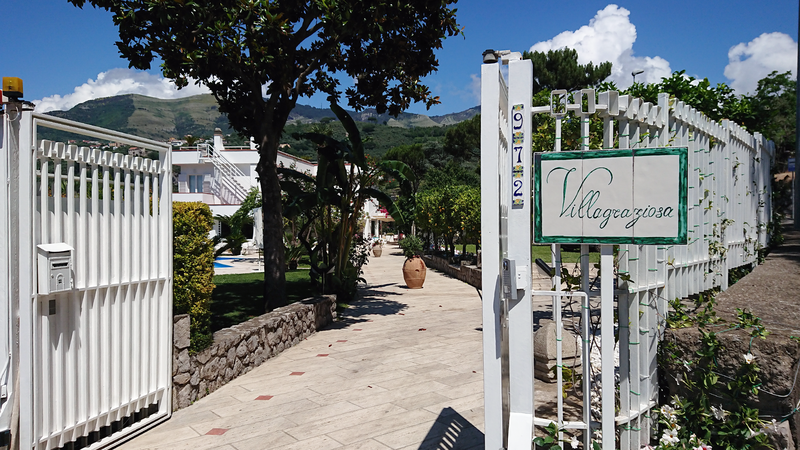 You will enter Villagraziosa through a paved garden full of lemon trees, grapefruit trees, banana trees, palm trees. From the garden, you will reach the pool where the sun, the sky and the nature warmly welcome you. Sit comfortably in the garden and you’ll see a mournful Mount Vesuvius and the spectaculate Gulf of Naples that laps it. The chirping of birds and the sea breeze will relax your senses. The scent of flowers fills the air. About the structure, the villa is about 350 square meters of indoor space, divided in two spacious floors, respectively, in Portugal pink marble and in wooden floor. The first floor is furnished with an open space kitchen, two big living rooms and a veranda where you can have breakfast or lunch looking at the Vesuvio and the Gulf of Naples. The night area is composed by 3 double bedrooms (each with a furnished private terrace, king size bed and a very lavish bathroom) and a suite , which, with its jacuzzi, is the biggest of the four. The suite is itself divided in two areas, a private living with a double sofa bed with a private bathroom and the master bedroom. The pool is 9 meters (29.5 feet) long by 4 meters (13 feet) wide, from 1 meter (3 feet) to 2.5 meters (8 feet) deep. The area is equipped with tables, chairs, deckchairs and sun loungers. The swimming pool is open from the beginning of April until the beginning of October. The furnishings in the living room are elegant. The furniture includes two sofa corners, two crystal tables and a unagalled crystal table. Ancient Etruscan vases and original paintings adorn the living room In this room you will find a satellite smart TV with Netflix and Amazon Prime function. From the living room you will be able to enter the veranda and the outdoor areas. The room is equipped with air conditioning / heating. The large windows make this veranda a unique place. Recall the bow of a ship, you can sit down and enjoy a lunch with the magnificence of Mount Vesuvius and the Gulf of Naples. The breathtaking view that you can enjoy from here is unique. The area is equipped with a wood-burning pizza oven, a gas BBQ, tables and chairs, a sofa station and a bluethoot sound system. A large open space makes this kitchen an ideal place to prepare tasty dishes in the company of its guests. Embellished with pink Portuguese marble and Brazilian black marble, it has a beautiful fireplace and large windows overlooking the pool. Equipped with everything you need, you will find an electric oven, a microwave oven, an automatic coffee machine with a coffee grinder, a dishwasher, five-burner gas cooker , a fridge and a freezer. Going up the stairs you will be able to enter the first bedroom named “Copper”. The name is given by the presence of a work of art entirely in copper that acts as a back of the bed, furthermore other elements in the room recall this metal. The bedroom has a double bed (160 cm / 62 inches, wider than a queen-size bed). In this room, you will find a satellite television (local channels) with Netflix and Amazon Prime function. The room has a private terrace with tables and chairs overlooking the pool and with views of the sea. The bedroom has air conditioning / heating, there is everything you need to prepare hot drinks (electric kettle and various infusion drinks). This bedroom has a private bathroom, equipped with a washbasin, a toilet and a large shower. This room is named after the famous Spanish artist “Gaudì”. The leitmotif is the art, behind the bed you will find paintings, the bathroom is characterized by the application of ceramic fragments, cut irregularly and fixed on a black plaster, just as the famous artist did in Parc Guell or Casa Batillò in Barcelona. To complete there is a large window overlooking the Gulf of Naples and Mount Vesuvius, the scenery is incredible. The bedroom has a double bed (160 cm / 62 inches, wider than a queen-size bed). In this room, you will find a satellite television (local channels) with Netflix and Amazon Prime function. The room has a private terrace with table and chairs overlooking the pool and the sea. The bedroom has air conditioning / heating, there is everything you need to prepare hot drinks (electric kettle and various infusion drinks). This bedroom has a private bathroom, equipped with a washbasin, a toilet and a large shower with a panoramic window. Furnished with ancient Roman vases, this room has something special. The back of the bed is an exhibition of ancient artifacts that give the room a unique elegance. The contrast between ancient and modern is perfectly balanced. It has a large private bathroom with a spacious panoramic shower, a private terrace with table and chairs with sea view. The bedroom has a double bed (180 cm / 70 inches, wider than a queen-size bed). In this room, you will find a satellite television (local channels) with Netflix and Amazon Prime function. The bedroom has air conditioning / heating, there is everything you need to prepare hot drinks (electric kettle and various infusion drinks). It is the largest of the 4 rooms, can accommodate up to 4 people, has a private living room with a double sofa bed, the master bedroom is furnished with fine materials. The walls are covered with silk, even the bed is covered in silk and is 180 cm / 70 inches wide, the private bathroom is all in travertine marble, the private bathroom has a Jacuzzi and a marble shower. The sofa bed has a double bed 160 cm wide / 62 inches with a mattress 18 cm high, satellite TV connected to the internet in both environments with functions netflix and amazon prime video. The room has a large private terrace with table and chairs overlooking the garden and the swimming pool.